The Forklift Half Dome has a wide angle 180o viewing area and is distortion free. Not only can the driver see what’s behind him, he can also view either side of the forklift. Complete with a bracket that can either be mounted through the cab roof or mounted to the cab upright supports. The back is moulded plastic with an adjustable ball joint, making it strong and flexible, allowing for easy angle adjustment and is fitted with an impact resistant acrylic face. 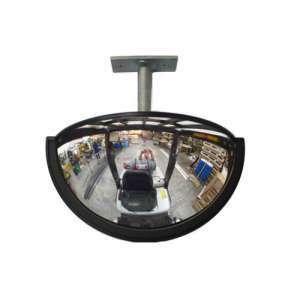 The 9" x 4" Half Dome Forklift Rear Vision Mirror has a wide angle 180o viewing area and is distorti..